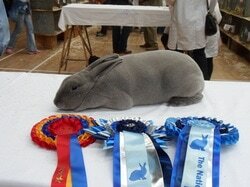 We are members of the British Rabbit Council who breed and exhibit Blue Rex. 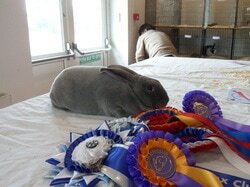 With over 30 years experience we have had a good deal of success with our rabbits. 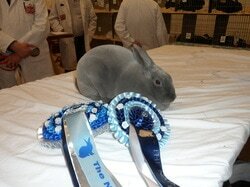 As well as winning numerous stock shows, we also won Best Blue at the London Championship Show in October 2011, 2014, 2015 & 2016. we are very proud and passionate about our rabbits. We only keep a small stud as we believe quality is better than quantity. 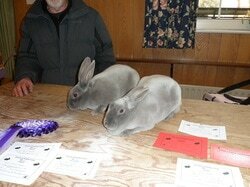 As Secretary and Chairman of the Blue Rex Rabbit Club, we are more than happy to help you find the perfect rabbit for you and offer advice to anyone who wishes to take on the Blue Rex for exhibition. We normally have several litters a year and so often have stock available of various ages. So whether you're looking for a family pet or some quality breeding stock to start in this wonderful breed, please feel free to contact us.